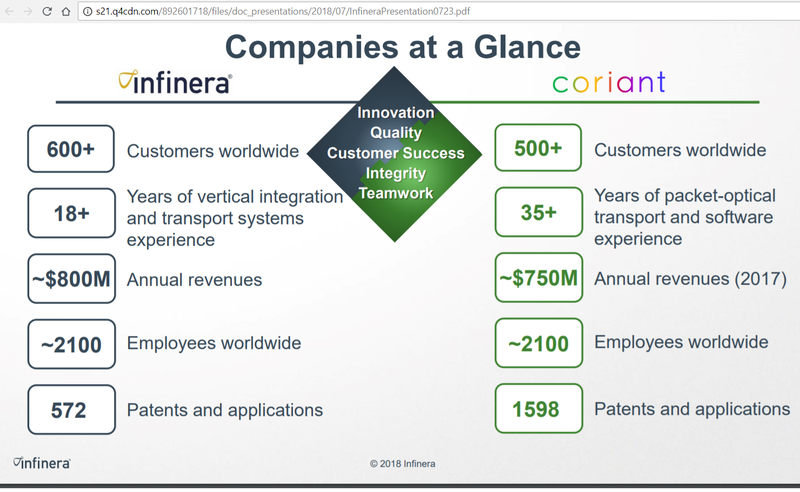 Infinera agreed to acquire privately-held Coriant, creating one of the world’s largest optical network equipment providers. Infinera will pay approximately $150 million in cash at closing, and estimated additional amounts of $25 million in the two quarters post-closing and $55 million over a period of years. Infinera will issue approximately 21 million shares, which when combined with the cash consideration, results in total transaction consideration of approximately $430 million. Coriant’s majority owner, Oaktree Capital Management, will be compensated largely in stock. Post-transaction, Oaktree will own approximately 12 percent of the combined company on a fully diluted basis. Infinera said the acquisition significantly scales the company as the next wave of global network spending begins as operators transform their networks from 4G to 5G, from Optical Transport Network (OTN) to packet and from closed to open network architectures. The company also says its vertically integrated business model delivers higher performance at lower cost for customers and higher profit margins for stockholders. The acquisition approximately doubles Infinera’s revenue and expands the company’s customer base to serve nine of the top 10 global network operators (five new to Infinera) and the top six global internet content providers (three new to Infinera). Coriant invested nearly $1 billion in research and development over the last five years to significantly advance its portfolio to address the growing demand for software automation and open, disaggregated platforms. Approximately 70% of Coriant's product revenue in 2017 (~80% projected in 2018) came from solutions that are new or have been refreshed in the last three years. 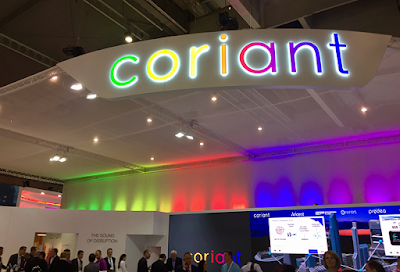 Coriant has over 80 trials in progress or have been completed to date in 2018 for Coriant’s suite of new products and automation tools. Coriant’s SDN orchestrator Maestro has been deployed operationally at one of the two largest Tier 1 service providers in North America. Coriant has added more than 20 new customers to date in 2018, seven of which are driving more than $1 million in annual revenue. Infinera recently upgraded its portfolio based on its Infinite Capacity Engine (ICE4). The acquisition is expected to close in the third quarter of 2018, subject to customary closing conditions. Coriant was formed in 2013 by private equity firm Marlin Equity Partners, combining Nokia Siemens Networks, Tellabs and Sycamore Networks. Coriant named Pat DiPietro as its new Chief Executive Officer, effective immediately, replacing CEO and Chairman Shaygan Kheradpir, who has stepped down from his role to pursue other opportunities. DiPietro will continue to serve as Vice Chairman of the Board, a role he has held since the founding of Coriant in 2013. DiPietro previously held senior leadership roles at Nortel and Bell Northern Research. He also previously served as Managing Partner at Canada’s VG Partners, overseeing the company’s Technology Fund. As a venture capitalist, he managed large portfolios and teams and sat on numerous Boards, including Sandvine, SiGe, Continuous Computing, BTI Systems and BelAir Networks. Coriant also announced that Reza Ghaffari has been promoted to the role of Chief Operating Officer (COO), a new position within Coriant. Ghaffari will continue to lead Coriant’s global service and support organization, while assuming responsibility for the company’s global IT, human resources, and facilities functions. Between 2000 and 2005, Ghaffari also worked at Verizon where he was responsible for innovation, product development, and strategic partnership programs. Singtel expects to kickoff its 5G trial by the fourth quarter of this year. The 5G pilot network, which will be conducted in partnership with Ericsson, will occr a0t one-north, the country’s science, business and IT hub. Singapore's Info-Communications Media Development Authority (IMDA) has allocated spectrum for the trial. 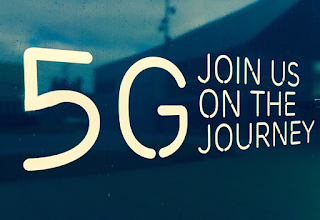 At a “Bringing 5G to Life” event held at Singtel Comcentre this week, Singtel and Ericsson demonstrated c3D augmented reality (AR) streaming over a 5G network operating in the 28GHz millimetre wave spectrum. The event also showcased emerging technologies from partners – Garuda Robotics, Intel, Meta, Rohde & Schwarz and Sony. Verizon has selected Ericsson to supply 4G equipment in additional markets across the U.S. Financial terms were not disclosed. The installations include Ericsson Radio System 4G LTE equipment, which is a 5G-ready platform that will allow Verizon to rapidly transition sites to 5G when they deploy the service in those markets. Specifically, Ericsson said the new markets will be deployed using its latest baseband and dual band radios, an optimized solution for widescale high-capacity deployment. The solution will be software upgradeable to 5G and will deliver CAT-M and NB-IoT for Massive Internet of Things use cases, as well as industry-leading network capacity. Iron Mountain, which specializes in secure corporate storage solutions, is working with Google to develop AI-powered SaaS solutions on Google Cloud Platform that help organizations analyze their vast physical and digital information and data repositories, to unlock insights, improve decision making and create new revenue streams. Iron Mountain expects to deliver these new subscription services built on GCP this September. In addition, Iron Mountain has selected Google Cloud as its preferred cloud provider for artificial intelligence and machine learning. "As the trusted guardian of information for 95 percent of the FORTUNE 1000, we know firsthand the challenges of understanding and acting on data insights," said William Meaney, president & CEO, Iron Mountain. "Whether it's a global insurance company or an oil and gas conglomerate, our customers depend on us to help make their physical and digital information useful and accessible while keeping it safe. This partnership with Google Cloud brings two industry-leading players together to deliver a new category of solutions for organizations looking to utilize their data's value, while closely managing their security and privacy." "We're delighted to partner with Iron Mountain to develop and bring new insight capabilities to market - particularly given their deep domain expertise and customer portfolio," said Tariq Shaukat, President, Partner and Industry Platforms at Google Cloud. "Customers in data-intensive industries like energy, financial services, healthcare and many others can create significant business value from the union of data with machine learning and content analytics." Arista's Any Cloud hybrid cloud networking platform is now available on Google Cloud Platform. This includes the virtualized Arista vEOS Router combined with CloudVision with Cloud Tracer functionality. Arista's vEOS Router leverages a cloud-grade routing stack and IPsec VPN tunnels to reliably and securely interconnect workloads across multi-cloud deployments. In addition, vEOS Router is integrated with Google Cloud provider APIs to enable easy deployment, automation, analytics, and end-to-end visibility. Arista CloudVision provides advanced visibility and automation, extending the cloud networking model of Arista on-premises cloud network platforms to Google Cloud Platform. Arista said its hybrid cloud platform now offers cloud platform-specific images for Amazon Web Services, Google Cloud Platform, Microsoft Azure Cloud, Microsoft Azure Stack on-premise Cloud, and common on-premises hypervisor platforms. Support in each environment is coupled with validation and registration of these solutions in the cloud marketplace infrastructure provided by each cloud provider, thus making deployment simple for enterprise customers. Arista Networks unveiled its strategy for extending its Extensible Operating System (EOS) across private cloud datacenters and public cloud providers. The Arista Any Cloud software platform will support Amazon Web Services (AWS), the Microsoft Azure cloud platform, Microsoft Azure Stack, Google Cloud Platform and Oracle Cloud Infrastructure. Arista will also be providing integration with the Equinix Cloud Exchange, which provides direct high-performance connections to 70+ cloud providers. Key elements of the Arista Any Cloud solution include the Arista vEOS Router for hypervisors (KVM and VMware ESX) and for cloud platforms (AWS and Azure), and the Arista Cloud Tracer as a CloudVision-based application. Arista’s new Cloud Tracer assures that visibility and availability metrics are tracked consistently across the entire hybrid cloud environment, including public cloud direct connections, remote datacenter connections and cloud exchange points. Arista said its Any Cloud solution will provide its enterprise customers with a common Universal Cloud Network experience. “Arista’s Any Cloud platform transcends public and private clouds, radically changing the on-premises enterprise datacenter. We are helping customers realize their hybrid-cloud transformation by extending Arista EOS and CloudVision across network boundaries,” said Jayshree Ullal, President and CEO for Arista Networks. 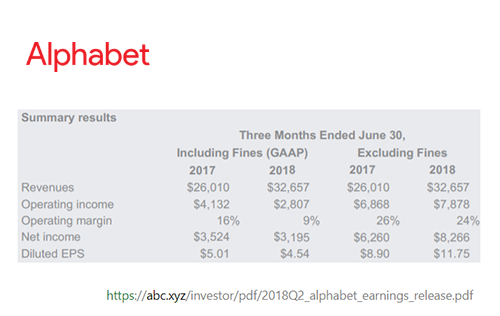 Alphabet reported revenue of $32.657 billion for its Q2 ended 30-June-2018 up 26% versus the second quarter of 2017 and 23% on a constant currency basis. Toshiba Memory Corporation launched its first NVM Express SSDs utilizing 96-layer, fourth generation, 3D BiCS FLASH memory technology. The new XG6 series client SSDs features a PCI Express (PCIe) Gen3 x 4Lane and NVM Express (NVMeTM) 1.3a interface. The XG6 series delivers sequential write performance of up to 2960 MB/s in client SSDs. Sequential read performance is up to 3180 MB/s, up to 355,000 random read and 365,000 random write IOPS. The power consumption is maximum 4.7W in active mode and 3mW during stand-by in the lowest power mode, which makes it suitable for power-sensitive mobile PCs. The new SSDs will be available in three capacities, 256GB, 512GB and 1024GB, all on a single-sided M.2 2280-S2 form factor.